It’s also a nice time to reflect and take stock. 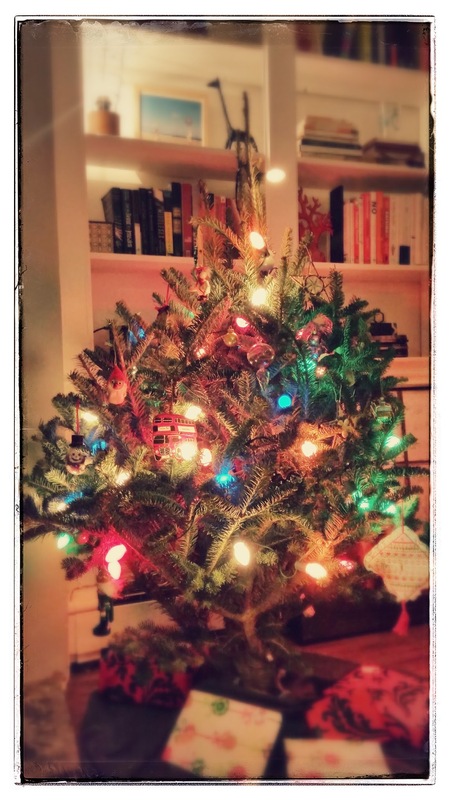 Sitting here with my lovely little stump of a tree (couldn’t resist showing you my 3-foot charmer) I’m reminded that things have come together in my home this past year. One of my long-term projects has been finding art for my walls. This area in particular, above my console, was screaming for a gallery-like composition. But I didn’t want to rush it, nor did I want it to feel too cookie-cutter. It’s finally taken shape with the help of some good – and practical – sources. And while I’m all about investing in original pieces that last a lifetime, it’s not always reasonable (hello, mortgage!) So I’ve corralled them below if you’re embarking on your own personal gallery mission. Enjoy! This place always delivers. The original Brooklyn Flea was set in Dumbo, and back before Brooklyn exploded, they were more focused on antique-y type dealers. Now they’re full-fledged productions with even more space for hipsters and horticulturalists to peddle hand-made jewelry and artisanal honey. Once in awhile you’ll find a pop-up Flea, like I did last fall in Park Slope, so it pays to scope out different neighborhoods. 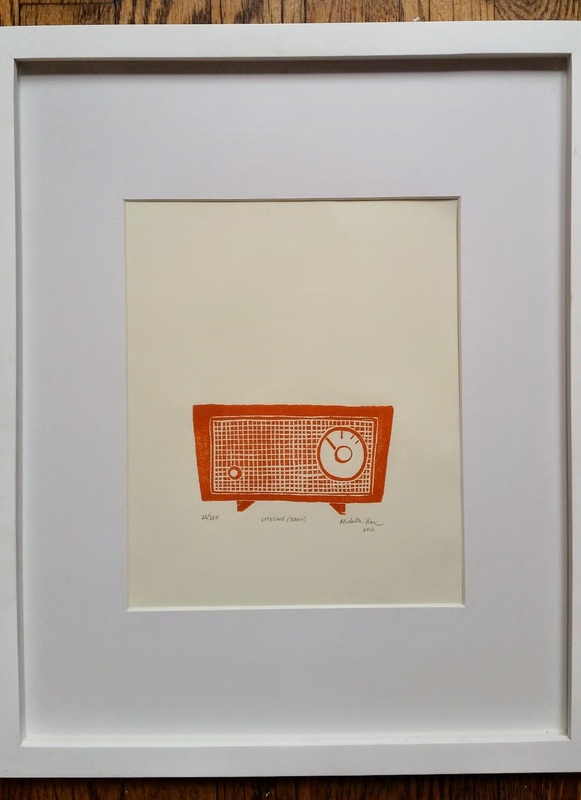 I was happy to stumble upon this piece by Michelle Han, a local Brooklyn printmaker: not only do I love the hand-carved quality of this print, but I love music and tend to get nostalgic for the days before we streamed everything. So this makes me smile each time I see it. 14″ x 17″ Wood Gallery Frame by Pottery Barn. For those of you not in the NYC area, Etsy has a huge range of art, from hand-screened prints, original paintings and custom work. I purchased this bike print a few years ago (which is why I sadly don’t recall the name of the Etsy store), but I love it. 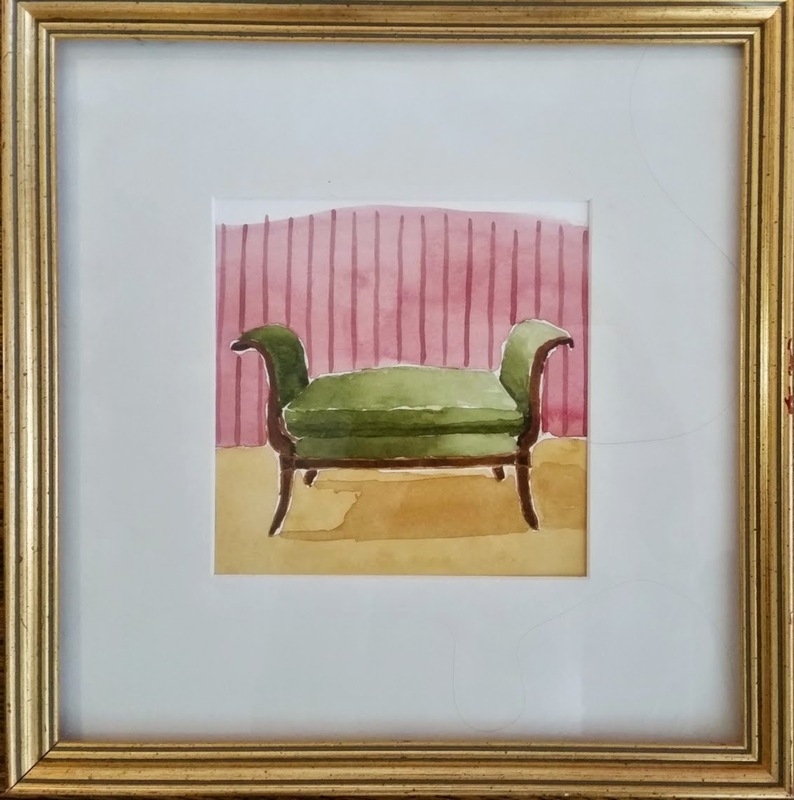 And framing it was an exercise in recycling: I found a great frame at a yard sale and ditched the previous owners’ oil painting. Then I “float-mounted” my new print on piece of charcoal gray paper so as to stay in step with my color scheme. (I’ll revisit some more framing tricks in another post). I think the dark background helps highlight the print. On Saturdays in Union Square, you can find loads of artists selling their wares. This is my third piece from a photographer I met there, Matt Schwartz. He creates his pieces from actual Polaroids, peeling away thin layers to give them an aged effect. Consider his work a precursor to Instagram. You can find him online at SheHitPause studios. While their selection is varied (read: hit or miss), they’ve got some gems. 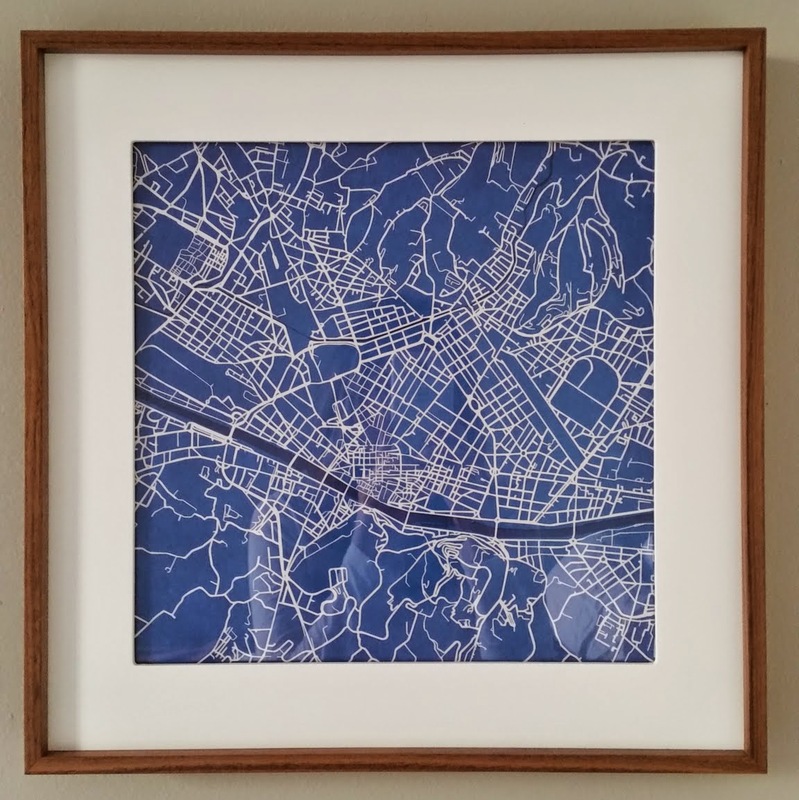 From their series of map line drawings, I chose this Florence map, and it brings back nice memories. Florence is the first place I ever traveled alone outside the states, and it reminds me of the many miles I walked. For some reason, this seems a much better tribute to those two weeks, versus even the best framed photo I could have ever taken. 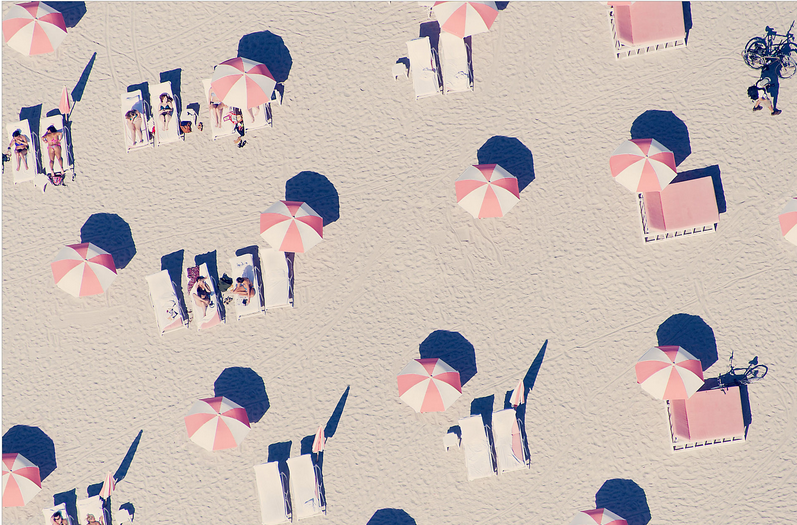 LA-based photographer Gray Malin takes fantastic travel and aerial photography. I found this aerial shot of a Miami beach on One Kings Lane, but you can go right to the source as well at graymalin.com. I loved the accidental repetition of the umbrella shadows, and went large-scale with this one to hang solo on a separate wall. I’m having this puppy framed up nice…ie, custom. #happybirthdaytome Check back to see how it turns out. 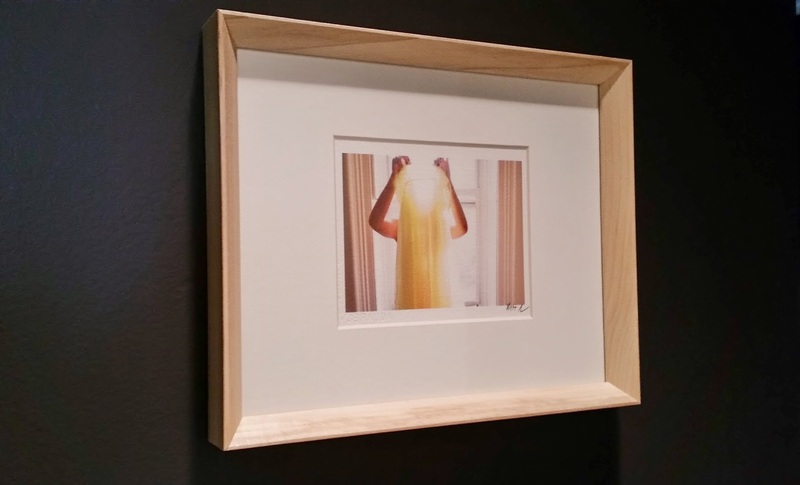 Speaking of framing, I have some favorite sources there too: AI Friedman, Ikea, CB2 and Pottery Barn – all make great quality frames in loads of sizes. And while its tempting to order standard frames that match, it was even more satisfying to incorporate hand-me-downs and flea market frames that lend a nice a patina and sense of originality. And just to make sure I had something original, I framed one of my practice watercolors from class. It’s nowhere near perfect, but it’s a happy little piece, and it reminds me that some of my favorite pieces have no price at all. I love Gray Malin! 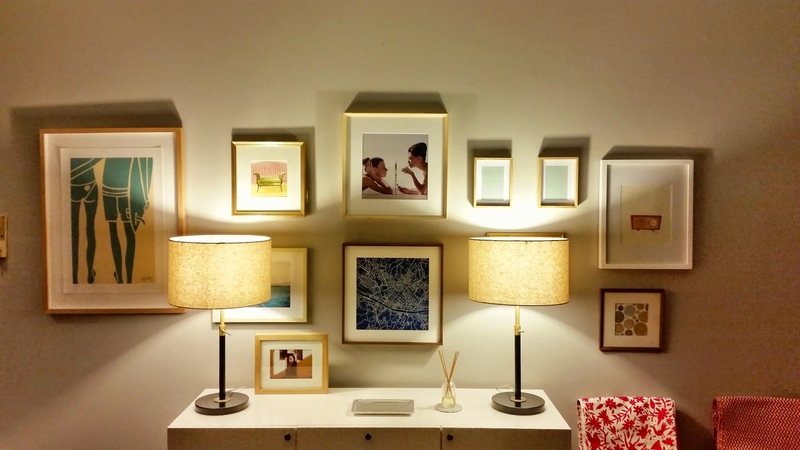 Great artwork you’re accumulating – including yours. I’d take that in a heartbea!